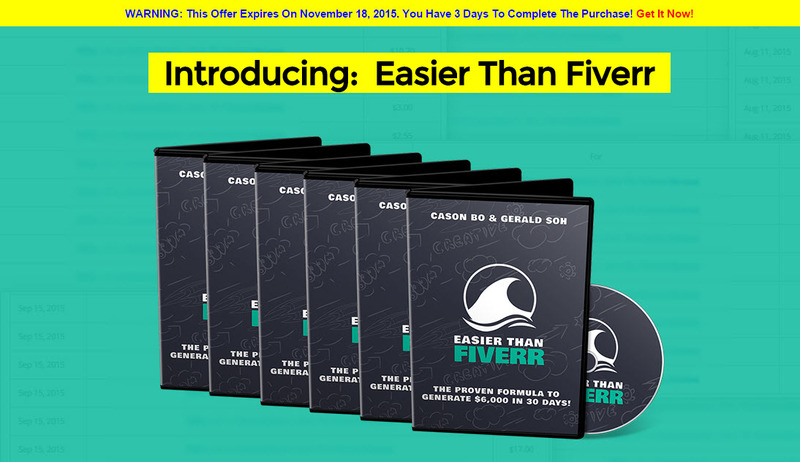 Welcome to Cason Bo Easier than Fiverr review! Cason bo is an internet marketer and this is his first product which he launched in 2015. He is also known as SEO specialist. Before going in depth review of this product; let's first see the overview. See my #1 Recommended Business to Earn Full-time Income! Easier than Fiverr was launched by Cason Bo in mid of 2015 and there is a lot of buzz about this program is going out. As the name indicates, it a method that guides you to earn money which is easier than Fiverr. 5rr is a platform where buyers purchase each service from the seller for $5 and it is mostly SEO related. Source Market is another platform that was also launched in this year and it is also very similar to 5rr except that there is no minimum $5 limit, no 20% deduction and it is totally SEO related activities. This platform is getting bigger and bigger. Easier than Fiverr is a product that guides you how to earn money from Source Market. What is Included in Easier than Fiverr? Module 1: Overview – This module is all about the summary of the whole system that Cason is discussing in next modules. Module 2: Account Setup – It is guidance on how to create your source market account. Module 3: Service setup – This module contains four videos and it guides about how to create your service, types of services, where to outsource, and creating extra services. Module 4: Getting your first sale – Making the first sale is very difficult and it is a guide on how to do it. Module 5: Reviews and testimonials – This is the further extension of the previous video and in order to get your first sale you must need reviews and testimonials. Module 6: Conversion techniques – Learn how to convert visitors into more paying customers in order to increase your profitability. Module 7: Keep customers coming back again and again – This is important to increase profitability and you will learn different techniques for this purpose. Module 8: Long-term big money plan – This module is all about how much money you should set for your service so that it constantly getting orders. Often people failed because they set too high at the start. Module 9: Macro success fundamentals – It is two models of success formula that can help you to earn more if you follow while offering your service. Module 10: 15 minutes action plan – Just watching the videos again and again would not help you to earn money. It is the action that gives you the results. It is one of the legit business models out there. Though not the best you can earn good money regularly if you have certain skills. Another good thing is that the skills required are not 100% but if you can do small tasks like keyword research, create backlinks, on page SEO, write content etc. then this model can be exploited for to earn some good bucks. The earnings may not be high at the start but if you get few orders in the start and get good reviews then you have completed your most difficult part and now it’s time to earn quick bucks. If you are looking for creating your own website then it takes a longer time and required more hard work to get results but platforms like source money you can get instant results because it is new and you can get orders very quickly. Source Market was launched recently and it is growing very rapidly. I still feel that there is great potential for this market and this is the right time to start. Acquire some of the SEO skills and start working. If you move to 5rr then it is now impossible for the newcomer to get orders. There are a lot of good points Cason Bo has included in his trainings and definitely helps you while you work on this site. Good training includes how to get your first order, reviews, and testimonials; two macro success fundamentals; setting a price at start etc. I think these type of information provides great insight to the viewers. There is a lot of buzz about this program but when I saw training modules then I find it incomplete. To be honest, I am expecting some ideas on how to perform certain SEO tasks but I could not find. The original price is just charged for letting you know about the program, creating an account and how to get first orders etc. I think this is much more typical information and everyone knows about this. Most people know that in order to get the first order you must join exchange platforms, help from friends or use social media, but the actual thing that a buyer is looking in the training on how to perform a certain service is missing. If you want to learn something then you will have to purchase Cason upsell and he will guide you about how to buy PBN domains. In his original training, Cason focuses too much on action. This is good but if a newbie who has purchased this course then give him some value so that he/she can create his service confidently. Sorry to say this product lacks such a thing. #1. Copy and Paste Campaign – It is training on buying PBN domains and sell to the customers. The training started quickly without guiding what to do but overall it is ok and if you understand it well then you can use it on Source Market platform and can earn good money. Moreover, he also provides you with a list of 5000 domains that will be updated weekly along with the password for the Majestic account to be used for this purpose. #2. Done for Your Campaign – It is not done for you and you have to do yourself. What they have done is that they have mentioned the seller name to whom you can outsource your service after taking from this platform. This is not easy and it takes a long time to understand this with a lot of risks. Join their Mastermind Group – It is for people who want to get personal support from Cason Bo through Skype. Definitely, you will learn by talking to a person who is very successful and can guides you a great deal. On the sales page, Cason has included a lot of claims that sales in the first 24 hours and even hundreds of dollars in the first 24 hours. To be honest, don’t focus on these things as it is not easy to earn even your first dollar rather looking for hundreds of dollars in the first 24 hours. Well, I am not saying it is impossible but as a beginner it is impossible. In sales page and video he claims that he is also a beginner but I have seen his videos and he has a lot of past experience with him. To be honest, it is an ok product and in order to start earning money then you must have to purchase upsells (especially first one). I think the market is pretty much open and there is room for everyone to earn some money. Learn some skills within few days and start earning money. Though it is not easy in the start if you get some orders initially and positive reviews then definitely you will earn more. If want to build an online business that is based on your passion and are based on the legit business model then leave all other sites and see my #1 recommendation.